Have you ever seen something and just instantly fell in love, knew “this is the one”? That’s kind of what I felt the first time I saw a dahlia quilt. Curvy, colorful, big and beautiful. When I came across the Dahlia quilt pattern from Prairie Grass Patterns, I knew I’d found my entre to the quilt of my dreams. It took me a little while to get to it, but when I did, I couldn’t stop until it was done. I used largely Tula Pink fabrics with a bit of Timeless Treasure’s Studio Basics blender and a wee touch of Cotton + Steel. It’s all machine pieced, then hand appliqued to the background fabric. I machine quilted each blade of the dahlia, echoing the lines of the piecing. Then I echo stitched around the dahlia on the background fabric. 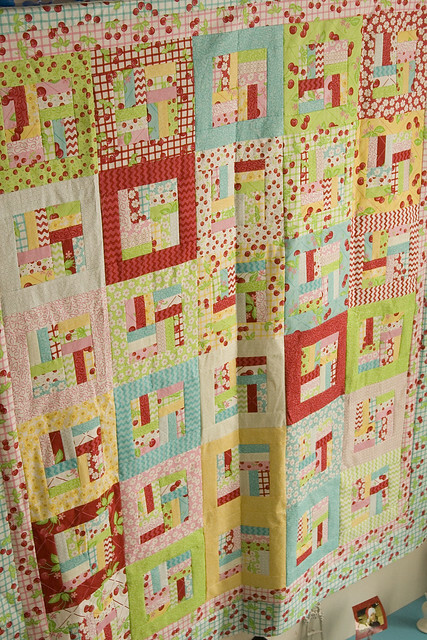 The finished mini quilt is about 25″ square and I’m pretty happy with how it turned out. It was a good learning process without the level of intimidation that is the Giant Dahlia pattern. And now that I’ve done it, I know I want to follow through and make the dahlia of my dreams. I’m so excited to have finished this quilt! It’s not perfect but that’s OK. I did change the pattern a teeny bit and used the pink gingham/cherries as an inner border with the aqua version of the fabric as an outer border, instead of using the two equally in the border. I still need to pick out the backing and binding but I’m not in a huge hurry right now, especially since I’ll be sending it out to get quilted. One down, 11 to go! We’re still snowed in down here in Hothlanta, so I ventured to my poor, neglected studio to spend some time with the quilt I started right after Christmas. I fell in love with this Oh-Cherry-Oh! fabric by Me and My Sister Designs for Moda as soon as I saw it and promptly bought the fabric I needed to make the Simply Sweet quilt pattern that was released with the fabric. And then ignored it. For two years. I’m not big on making resolutions but I have decided to work through my stash this year and actually make some of the projects I’d planned with the fabric I bought. 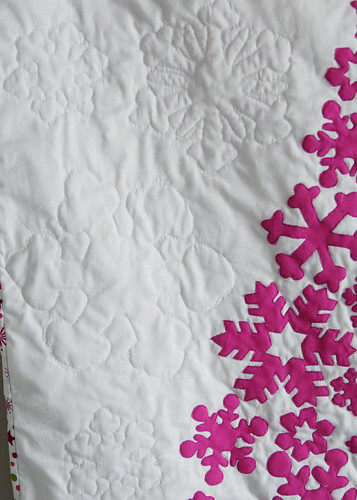 This quilt seemed like a good place to start, especially during these dreary, gray days. My intention was to get back to work on it as soon as the kids went back to school in January but that didn’t happen quite like planned. This week was starting to look like a bust, too, but then Miss L spent yesterday afternoon at a friend’s house around the corner — ideal time for doing a little sewing. Today’s been a little less productive but I’ve at least got the block centers planned and even managed to sew a few of them before the dogs chased me back upstairs. (And what is up with that? They’re both asleep on their bed again but I know they’ll be at my heels the minute I set foot on the stairs. Bossy puppies.) It’s just the pick-me-up I need right now, between the cold temps and the icy roads. I find it nearly impossible to accomplish much of anything crafty from Thanksgiving until the new year. There’s just so much on my plate and then the kids are home more, so I just don’t seem to get much done. This year’s time crunch coincided with another crafty slump, which was a little discouraging, because I actually had the time and desire to make something — I just couldn’t get motivated. After spending most of a day cleaning up my studio (the clutter tends to adversely affect my crafting), I decided to run over to the shop and pick up some new fabric I’d been admiring and a new quilt pattern to go with it. The new V&A line from David Textiles had me all ga-ga at Market, so I picked out a few fat quarters of it along with some of Tula Pink’s Parisville and a couple of shot cottons. I thought all of it was perfect for the Coming Soon… pattern by Thimble Blossoms, which is actually meant to be a baby blanket but I’m thinking it’s a nice size for a throw. This is really my kind of pattern: quick, cute and easy. I did make an error in cutting and had to add a couple more of the green-and-cream strips in the middle of piecing but that wasn’t a big deal. 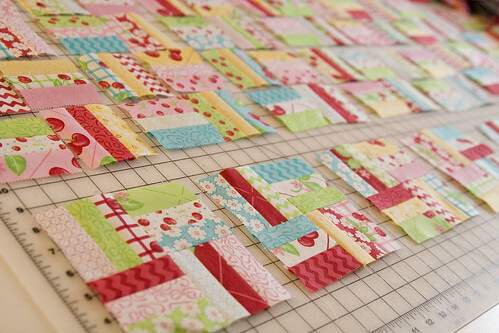 I’m toying with the idea of pulling off the border and making a wider one, which is something Sarah suggested. And I still need to pick out a backing fabric (leaning towards flannel or Minky/Minkee) but I’m pretty sure I’m going to bind it with the green. One thing I will do is orient the quilt differently. 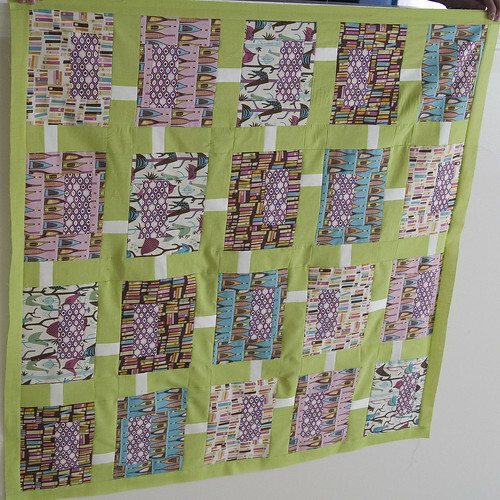 I used directional fabric so all my books and wine bottles are sideways! LOL! Hey! What’s that thing hanging from the tree in my front yard? 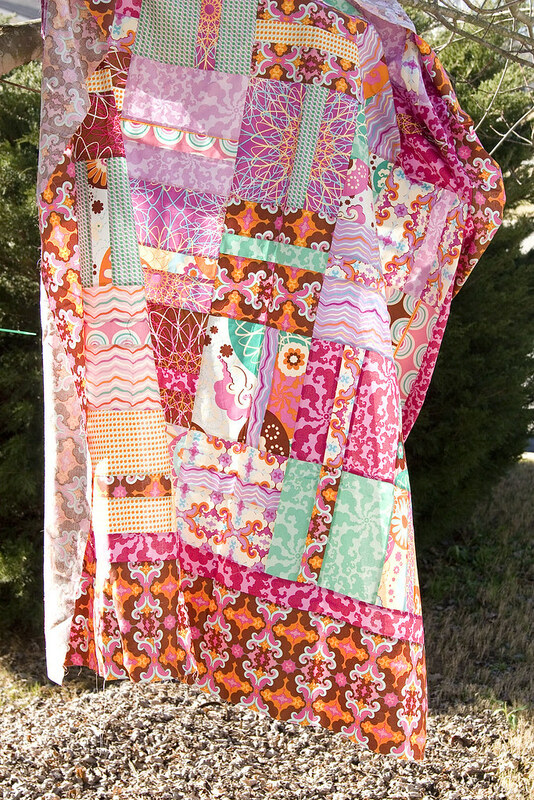 Could it be … a quilt top? Why, yes. Yes, it is. And I made it. 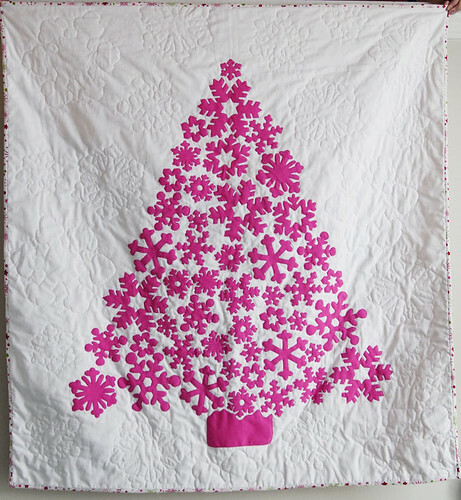 It was such a big deal to me, that I told pretty much no one that I was making a quilt. Seriously, if it hadn’t turned out, no one would ever know I had even tried. It did, though, so now I’m going to be a total show off. Tee hee! We’re all friends here, right? So you’re going to be nice and sweet and completely ignore my goof ups (which I’m not going to detail myself). I think it’s not half bad for my first attempt at making a quilt. 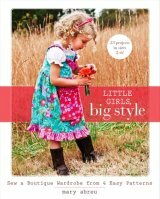 I used my favorite beautiful Sugar Snap fabrics (with the exception of one print, which we could not find anywhere in the shop that day). The pattern I chose because I thought it would be well suited for my temperament (i.e., lack of patience). It’s called Piece of Cake and it’s by Thimble Blossoms. Really met my expectations, in a good way. I think I did all the cutting one day and the sewing the next evening while watching TV. It probably came together in maybe three hours. That’s my kind of project! LOL! I now totally get what everyone was telling me about quilting being addictive. 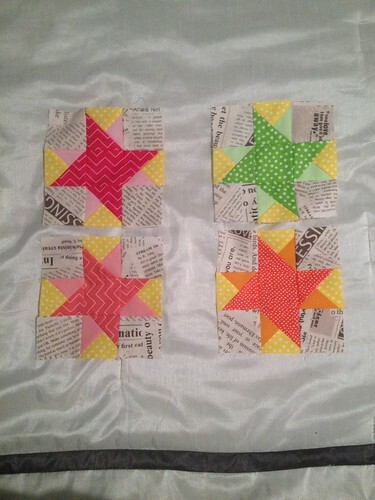 I seriously can’t wait to start my next one and have a stack of patterns picked out for probably my next six quilts. No idea when I’m going to sew them because I can’t even come close to keeping up with my current sewing to-do list as it is. I’m not sure about doing the actual quilting part of it. It’s part equipment, part skill and part time. Fortunately, there are plenty of folks who are willing to do that part for me, although I think I may do the binding myself, just because I love sticking myself in the finger repeatedly with a needle. OK, not really. But I do want to have that closure of finishing it. At least my first quilt.